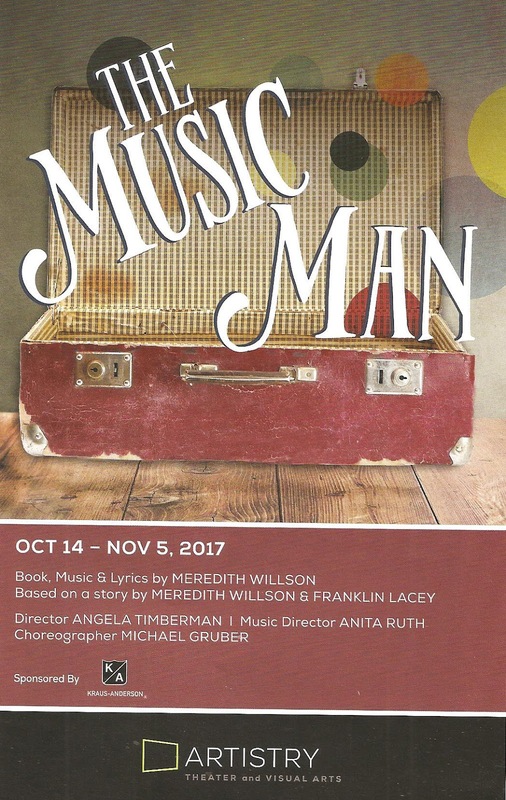 The Music Man is a classic of the American musical theater canon, and one that's held up fairly well with no uncomfortable racism and relatively little sexism (why does it still have to be a "boys' band?"). And Meredith Wilson's score is a winner, ranging from what might be the first musical theater rap song to gorgeous romantic duets. Artistry excels at these sorts of musical theater classics, so it's no surprise that their new production is a charmer. This also seems to be the sort of show that appeals to their core audience, judging by the fact that the entire run is already sold out. 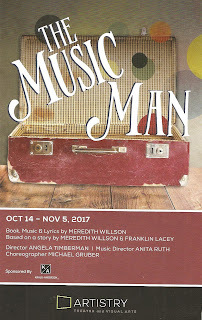 I would say that if you're looking for a good old-fashioned heart-warming, foot-stamping, enjoyable musical, head down to Bloomington. Except that you're pretty much out of luck for this run (call the box office to see if they've got anything left). Make plans to enjoy the rest of their 2017-2018 (which began with a bang in the form of an inventive and super-cool Joseph and the Amazing Technicolor Dreamcoat, which I'm guessing did not appeal to their core audience quite as much). I'm most looking forward to the final show of this season, the much more infrequently produced Sondheim masterpiece Follies. We're so lucky to have Broadway actor Michael Gruber in the #TCTheater community, here making his onstage debut at Artistry as Professor Harold Hill (the sole equity actor in the cast). He is utterly charming as the master salesman/spellbinder, but that's not all. He also choreographed the show, and it's pretty fantastic, with movement that makes this old show feel new. Michael is well-matched in Jennifer Eckes as Marian the Librarian, with a lovely voice as always. The kids in this show are so stinkin' cute they threaten to steal every scene they're in! Chief among them are an adorably precocious Catie Bair as Amaryllis (proving that talent runs in the family) and Liam Beck-O'Sullivan as Winthrop (who is actually a replacement filling in until the originally cast Brody Nielsen recovers from an injury). Liam affects a lisp that ends in a raspberry that just cracked me (and much of the audience) up every time. Too many great people in the cast to mention, but to name a few, Lolly Foy is a hoot as Mrs. Paroo, and so is Wendy Short-Hayes as Mrs. Shinn. And I love a barbershop quartet, and this one is pretty yummy (comprised of C. Ryan Shipley, Christian B. LaBissioniere, Joe McLaughlin, and Andrew Newman). 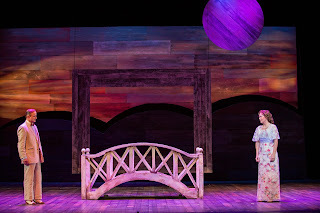 One of the funniest #TCTheater actors (who can also break your heart) Angela Timberman returns to directing after her directorial debut in last summer's Talley's Folly, and does not suffer from the sophomore slump in this energetic show that runs like clockwork. Joel Sass's simple, rustic, and effective set provides a great background for the story, and Ed Gleeman has attired this huge cast in colorful period costumes. Last but not least, Anita Ruth's 18-piece pit orchestra sounds glorious on this familiar and beloved score. This show also marked the first Twin Cities Theater Bloggers' event at Artistry. We were invited to come early and meet with the cast, as well as take a backstage tour. It's always fun to experience theater with my fellow bloggers, meet the artists, and get a peek into what happens behind the scenes. I thoroughly enjoyed another visit to River City, Iowa by way of Bloomington, Minnesota. If you're lucky enough to have tickets, you likely will too. Otherwise check out what else is going on in Bloomington this season. *Plot summary borrowed from what I wrote about the Guthrie production two years ago.